We went for a meal at The Mex last week and thoroughly enjoyed it. Not surprisingly the most of the menu is ..... Mexican, with a range of dishes including meat, fish, seafood and a good selection of vegetarian options. There is also a children's menu including favourites like chicken nuggets and pizza. Kids are most welcome and high chairs are available. They have a good drinks selection - particularly Mexican beers. Naturally many of the dishes are spicy - but I've always found the chefs here flexible either way. If you want something less hot - or a total afterburner - just ask the waitress and she'll advise you or talk to the kitchen for you. I had what I nearly always have - being predictable - the Meat Platter which contains a huge amount of dead animal and a decent amount of chilli. This includes meatballs, potato skins with chilli beef, pork ribs, tortilla chips and the usual dips like guacamole and sour cream. Jo had chicken bacon and avocado fajitas which came with rice plus a side order of wedges. The service was friendly and efficient - food came quickly which it usually does here. Atmosphere is relaxed and informal - you won't find the local and visiting food snobs here - they'll be at Alba or Porthminster Beach Cafe. The Mex offers pretty good value - at least by St Ives standards. Our bill came to £35.00 for two main courses, side, one dessert and two glasses of wine. What we usually do is go in early for their early meal deal menu - available from 5.30 to 7.00. 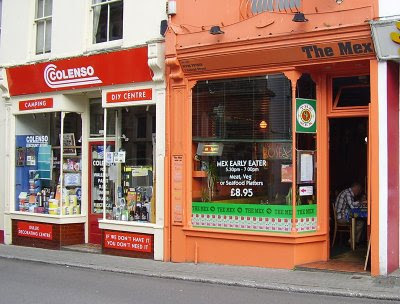 The Mex is very popular with locals and with around 30 covers is often full - so you're strongly advised to book. You can phone or call in when they're open, or when closed call into Colenso's (the shop next door). Always ask for one of the window tables - great for people watching. The restaurant is on Gabriel Street, opposite the library. We have eaten here many times and I agree 100% with your review. We have never been disapointed. 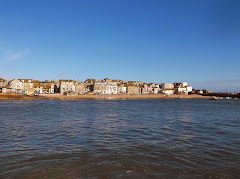 Brilliant place to eat when in St Ives. We've also done that meat feast with their jug of Margaritas. Very nice, too. You do leave feeling stuffed. Other favourites: ribs from Yeungs, burgers at Blas, and the Dover Sole at The Mermaid. Paella for two at the Blue Fish Cafe was also good so it's sad to see them closed. For cheap eats, the giant traditional pasties from the Cornish Bakery on the Wharf Rd near Fish St (NOT the one in Fore St — same chain, different sources) are rammed with chunky steak and have a nice pastry. Also Pengenna's pasties (Cash Point Alley) are good. I miss Blue Fish as well. But .... looks like a new restaurant is opening there - The Loft. Sign outside says opening July 2009 so we'll see.